Why’s it hot? Every spring the ironing board-flat landscape southwest of Amsterdam bursts into a psychedelic blaze of colour as millions of tulips, daffodils and hyacinths come into bloom. It’s an extraordinary and uplifting sight that is easily enjoyed on a day trip from the city, or book a restorative short break staying in the nearby town of Leiden. What’s it got? Keukenhof (keukenhof.nl), in Lisse, is a historic, tree-filled park that has been showcasing the Dutch talent for growing flowers for over 60 years. A visit here (£13 entry) is a cross between going to the Chelsea Flower Show and touring some zealously maintained country house gardens. Yes, it does get a lot of coaches, tour groups and galloping grannies, but the exhibits also tune into the trendy side of gardening. The grounds are dotted with contemporary artworks and sculptures, and this year the theme is ‘United Kingdom – Land of Great Gardens’, so we’ll all feel even more at home. Wow factor: Seven million bulbs have been planted by hand, creating great swirls of colour. 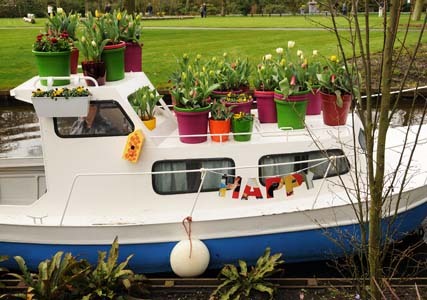 Don’t miss Keukenhof’s Be Inspired! gardens which include entertaining designs for small spaces on themes such as Camping, Quiet and Easy. Another must is the orchid-filled Beatrix Pavilion which has mannikins dressed in natural materials including lichen, bark and even eggshells – which sounds weird but is very impressive. Just outside the park you can hire a bright orange sit-up-and-beg bike from Rent-A-Bike van Dam (rent-a-bikevandam.nl), then go freewheeling through the colour-charged and intensely fragrant bulb fields. Prices start from £10 and options range from a one hour circular tour to a 21 mile trip taking in the seaside resort of Noordwijk. Need to know: Thanks to the recent cold weather the flowers are only just coming out, with a sea of purple, white and yellow crocuses leading the way. Everything should be blazing in a few weeks and as the bulbs are planted with a technique called ‘lasagna layering’ the blooms just keep on coming. Kuekenhof stays open till 20 May and can be reached on a dedicated bus service (line 858) from Schipol Airport. Big things are happening in Amsterdam this year with the unveiling of the masterpiece-filled Rijksmuseum (rijksmuseum.nl) on 13 April (after ten years of renovation! ), followed by the re-opening of the Van Gogh Museum (vangoghmuseum.nl) on 1 May. New places to stay here include Andaz Amsterdam Prinsengracht (andazamsterdam.com) and Hotel V nesplien (hotelvnesplein.nl). 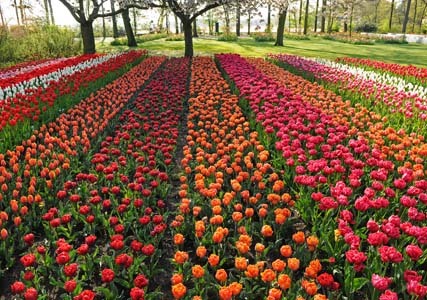 Alternatively, Leiden (leiden.nl) is a 20 minute train ride away and has a direct bus service (line 854) to Keukenhof. A university town complete with pretty canals, gabled warehouses, historical museums and mighty windmills, it offers a more relaxed base – Rembrandt was born here. 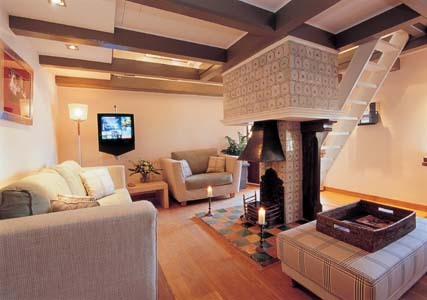 For somewhere romantic, stay at De Beukenhof (debeukenhof.nl) in the wealthy suburb of Oegstgeest, which has nine luxurious suites from £231. Book now: KLM (klm.com) flies to Amsterdam from 23 UK airports, from £99 return. The Netherlands (£14.99, Rough Guides) is a comprehensive guide, for more information see holland.com.